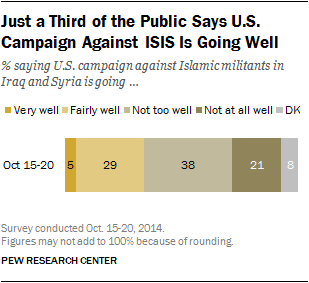 The public continues to support the U.S. military campaign against Islamic militants in Iraq and Syria. 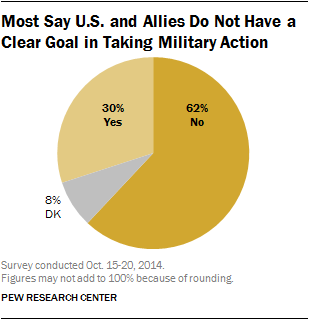 But most Americans say the U.S. military effort against ISIS is not going well, and just 30% think the U.S. and its allies have a “clear goal” in taking military action. The new national survey by the Pew Research Center, conducted Oct. 15-20 among 2,003 adults, finds that 57% approve of the U.S. military campaign against Islamic militants in Iraq and Syria, while just 33% disapprove. Support is highest among Republicans (68%); majorities of Democrats (54%) and independents (55%) also approve. Yet negative evaluations of how well the U.S. military campaign against ISIS is going also cross party lines: 64% of Republicans, 61% of independents and 52% of Democrats say the military campaign is going not too well or not at all well. Moreover, majorities across the board – 70% of Republicans, 65% of independents and 54% of Democrats – think the United States and its allies lack a clear goal in taking military action against Islamic militants in Iraq and Syria. While Americans have doubts about the effectiveness and goals of the military campaign, many remain wary of the United States becoming too deeply involved in the conflict. Currently, 47% say their greater concern is that the U.S. will go too far getting involved in the situation, while 43% are more concerned that the U.S. will not go far enough in stopping Islamic militants. The share saying their bigger concern is that the U.S. will become too deeply involved in the situation has increased from 41% in mid-September. And as other polls have shown, the public is opposed to the United States deploying ground troops to fight ISIS: 55% oppose sending U.S. ground troops to fight Islamic militants in Iraq and Syria, while 39% say they would favor this. While President Obama has touted the involvement of other countries in the military effort against Islamic militants, the public is skeptical of the contributions made by U.S. allies. 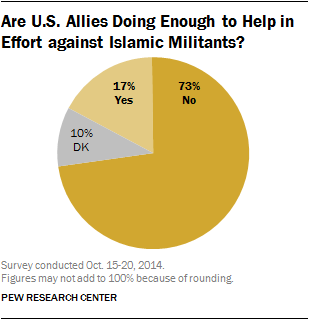 Overall, just 17% say countries that are allies with the U.S. are doing enough to help the U.S. military effort against militants in Iraq and Syria; far more (73%) say they are not doing enough. There is hardly any divide across party lines on this question, and majorities of nearly all demographic groups say U.S. allies are not doing enough to contribute to the military effort. Republicans are far more concerned that the U.S. will not go far enough in stopping Islamic militants in Iraq and Syria (63%-30%). By contrast, Democrats (57%-32%) and independents (51%-41%) express more concern over the U.S. going too far getting involved in the situation. Opinion among Republicans and Democrats is little changed from mid-September. But among independents, whose opinions were divided a month ago, more now worry that the U.S. will go too far in getting involved than say it won’t go far enough to stop the militants. Across age groups, 65% of those under 30 say they are more concerned that the U.S. will go too far getting involved in the situation, while just 28% are more concerned about not doing enough to stop the militants. Older age groups are about evenly divided or express more concern over the U.S. not doing enough. Opposition to the use of U.S. ground forces to fight Islamic militants in Iraq and Syria spans most groups. Majorities of whites (53%), blacks (62%) and Hispanics (55%) oppose the use of ground troops, as do half or more across age groups and education levels. Women oppose the deployment of U.S. ground forces to Iraq and Syria by about two-to-one (62% to 30%), while men are evenly divided (48% are opposed while 47% are in favor). Republicans stand out for their support of U.S. ground forces in the fight against ISIS. 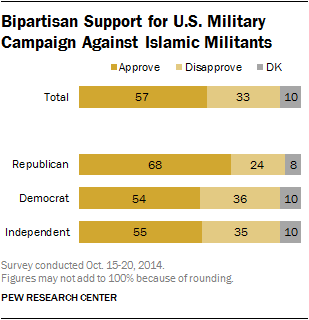 By 57% to 39%, Republicans favor sending U.S. ground troops to fight Islamic militants in Iraq and Syria. 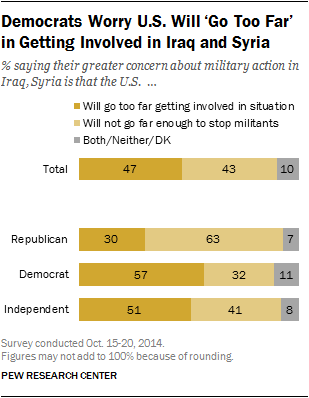 By contrast, 56% of independents and 66% of Democrats oppose the use of ground forces to combat the militants. Public opinion about U.S. military action against Islamic militants in Iraq and Syria has changed little over the past month. Currently, 57% approve of the “military campaign” against the militants; in mid-September, 53% approved of Barack Obama’s “plan” for a campaign against the militants. Women remain less likely than men to support military action. About half of women (52%) approve of the U.S. military campaign against the militants, compared with 63% of men. Support for the military campaign is lower among those younger than 30 (50% approve) and 65 and older (52%), than it is among those 30-49 or 50-64 (59% and 64%, respectively). Nearly seven-in-ten Republicans (68%) approve of the military campaign against the Islamic militants, compared with 55% of independents and 54% of Democrats.